The company is trying to promote water conservation as a way to limit impact of another round of rates hikes. New York American Water, chastened last year by ratepayer revolt and state investigations over rising water bills and financial irregularities, is working to head off sticker shock in the summer watering season as another round of rate increases looms April 1. The company has been holding local workshops to educate customers on conservation programs and tools to help users lower bills despite the rate hikes, which will mean an increase of up to 7.85 percent in some areas, where the company is also blaming property taxes for encompassing up to 59 percent of bills. “I’m hoping we see a good reduction in our customers' usage, because at the end of the day it will help the Long Island aquifer, but it will also help our customers save money,” new New York American Water president Lynda DiMenna said in an interview at her Merrick headquarters. But opposition groups that have been working to split their districts off from American Water’s corporate ownership say they aren’t buying it. One group held a protest at a sparsely attended workshop in Glen Cove on Friday. Since last year’s summer of outrage following implementation of a “conservation” rate that sent bills skyrocketing for some consumers, the company has conducted a survey of thousands of local customers to review high-usage patterns and began a campaign to educate customers on the reasons water bills can shoot up, to help moderate the increases. A state-appointed monitor has been reviewing company operations, sometimes on site in Merrick, and making recommendations. “They’ve been here. They’ve done due diligence, their analysis, and we meet with them on an as-needed basis,” DiMenna said, adding that in some cases the company’s plans for outreach often predicted recommendations from the monitor. PSC spokesman James Denn said, “We are pleased with the monitor’s work thus far, and the review process remains on schedule.” A PSC report on last year’s South Shore billing issues is due out June 30. American Water’s detailed analysis of customer usage patterns and surveys of more than 5,000 customers in the Long Island district found average residential customers in the summer use up to twice the water of its customers across the nation: 13,500 gallons for local users in July, compared with around 6,200 gallons in its other territories. Most of that usage is for watering lawns and gardens. Many of the systems use automated irrigation timers that send water spouting on small lots regardless of the weather or need, the company said. The new plan involves educating customers on the costs of high use, offering tools to help them reduce, and alerting them when their bills are beginning to spike. To help in the effort, the company will send out employees to read meters through its automated system midmonth, in addition to typical cycles, and those with the highest use will get an alert by text, email or other form. New York American Water customers pay rates based on tiers of usage, and last July, 17,622 Lynbrook water customers — 26 percent of the total — used more than 15,000 gallons, triggering the highest rate, the company said. Last year, after local lawmakers and Gov. Andrew M. Cuomo stepped in, American Water suspended the highest conservation rate for Lynbrook customers because the state found it didn’t adequately alert them to the increase and its impact. But customers and watchdogs say the focus on conservation is misguided, and diverts attention from the bigger issue of New York American Water's high rates. Opposition groups want state lawmakers to do more. 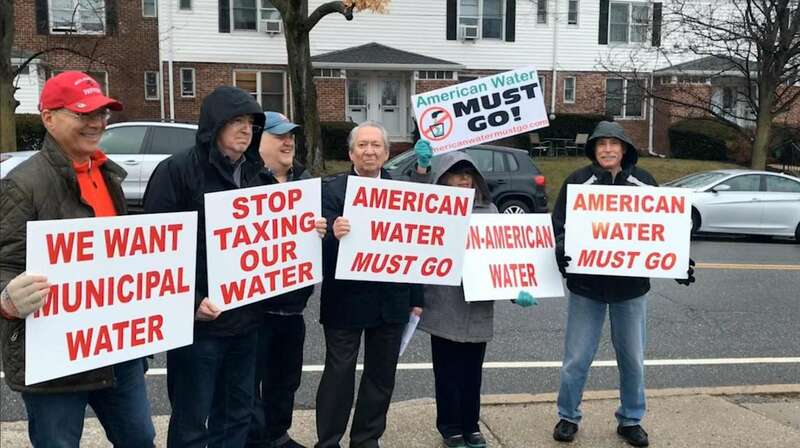 One bill in the State Legislature would exempt private water companies from property taxes in Nassau County, helping reduce the taxes that American Water says constitute up to 59 percent of customer bills in Sea Cliff, for instance. Opposition groups support the bill, but see it as an interim measure. American Water declined to comment on it. “History shows that even over the long term ... [municipalizing] still ends up saving money,” said Borecky, who called the notion of conservation a “joke,” because overall consumption in the region, while high, had been declining. Nadel said his North Shore group is concerned that too much conservation will trigger a clause that allows the company to raise rates if revenues drop a certain amount. The state-approved rate plan includes a mechanism that lets the company recover revenues that fall below a prescribed level through a customer surcharge; customers receive a credit on their bill if revenues go above that level, DiMenna said. “They don’t have to tell us to conserve, we know to conserve,” Nadel of the North Shore group said. “Certainly with their rates we’re going to conserve.” The group says municipalization, perhaps through a combination with the Jericho water district, will eliminate the corporate profit motive and property taxes, cutting rates even after borrowing to buy the system. But New York American Water argues customers are better off with its services over municipal water. DiMenna, in any case, said the efforts to split off won’t impact service. “We will work with our Sea Cliff customers up until the day we no longer are their provider,” she said.